"A New Republic of the Heart should be required reading for all humans over the age of 16." You'll receive a PDF + MP3 download. Your privacy is important to us. We'll also send you occasional emails with Terry’s writing, audios, & videos as well as announcements and updates about his courses, books and events. Very occasionally, we will also let you know about offerings from other people and organizations that are helping create a new republic of the heart. "In this profound study, Patten brings a wealth of integral thinking to a seminal perspective on human and cultural development. The genius of this work lies in the author's own deep knowledge of inner practices (Integral Cross Training) that offer a synergy of body, mind and spiritual practices which, together, evolves the human condition and elevates one’s ways of being and working in the world. What we have here is possibly the finest example of the making of the possible human and with this, the development of a possible world." A New Republic of the Heart addresses our global meta-crisis in all its aspects—environmental, economic, political, and cultural—from a breathtakingly all-encompassing perspective. Even more remarkably, it frames our global and societal crises and opportunities as challenges to us, now, personally—in terms that penetrate our usual abstractions and avoidance. In fact, our own future and the future of our very life-support system are shown to be utterly dependent on the quality, intelligence, tenderness, and courage of our ways of being. In this book, Patten demonstrates, in the most convincing terms, that inner and outer transformation are entirely interdependent. He shows us the difficult, necessary, creative, and ultimately rewarding work we must each engage in to meaningfully address our most “wicked” problems. He shows how we are all in denial about our collective situation, and invites us to understand and come to terms with the built-in mechanisms that spawned our multifaceted crisis in the first place. This book also movingly inspires us to our own potential for heroic goodness, which is latent in every human heart. We are shown the connections between personal growth, relationships, conversations, and a new, inclusive vision of community, public service and cultural transformation. Free excerpt is a PDF file that includes the forward and introduction, plus an MP3 file of Terry reading the introduction. "We all know that humanity is at a critical turning point—and this is THE manual for all who want to meet this moment as the historical call to action that it is. Combining brilliant social commentary along with a step-by-step blueprint for catalyzing whole-system change from the inside out, Terry shows us the way to rise into our personal and collective destiny." "In a world of exploding crises, we are all called to contribute. But how do we find our unique contributions, and how do we make them most effectively, and bring out the best in us and all those whose lives we touch? These are among the most crucial questions of our time, and Terry Patten beautifully elicits the wisdom within us with which we can find our answers." "Like all true spiritual guides, Terry Patten shows us how to open our hearts and respond to this suffering world. His book is thoughtful, careful, and joyful." 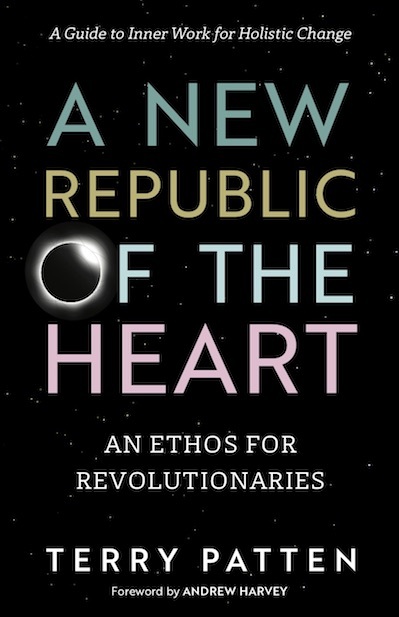 A New Republic of the Heart addresses our current planetary crisis in all its complexity and uncertainty, exploring the nature and implications of global citizenship, and clarifying a radical new understanding of practice and activism. Part One summarizes our cataclysmic ecological predicament, the wholeness underlying our inter-connected, more-than-human world, and the evolutionary and integral visions that establish a basis for a more integrated consideration of how we live meaningful lives in a time of crisis. Part Two explores an integral understanding of the nature of individual and collective spiritual practice, purpose, social responsibility, and evolutionary activism. These explorations point the way toward an integrated practice that is both personal and social and that enacts whole-system change—a process that is profound, radical, and all-inclusive. TERRY PATTEN is a philosopher, teacher, activist, consultant, social entrepreneur, and author. Over the last fifteen years he has devoted his efforts to the evolution of consciousness by facing, examining, and healing our global crisis through the marriage of spirit and activism. As an author, he co-wrote the book Integral Life Practice with Ken Wilber and a core team at the Integral Institute. As a teacher and consultant, he has worked on four continents, led a team at the HeartMath Institute that developed their first heart-rate variability monitor, and is the founder of the “Beyond Awakening” teleseminar series. As a community builder, he founded Bay Area Integral. As a social entrepreneur, he founded Tools For Exploration, a consciousness technologies company, and currently, he's involved in restorative redwood forestry and fossil-fuel alternatives. "In a stunning marriage of wild heart and cool mind, Terry Patten turns the black diamond of our global darkness to illuminate our hearts, hone our wills for selfless service, and resplendently deepen our commitment to enact our divine identity and its joy, whatever happens. This is a major work of pioneering originality accomplished with great intellectual grace and profound sacred passion."